History: In the times of Celtic tribes, Romans and Danes mistletoe was believed to possess magical power. It was additionally thought to be effective in increasing sexual desire and boosting fecundity. For this reason there is a nice custom to exchange hugs and kisses near a mistletoe branch. Used For: The plant is applied to cause vomiting and to soothe the nervous system in case of anxiety. Provides muscle relaxation, increases the arterial tension and boosts womb and bowel muscle contractions. The plant is characteristic of causing womb contractions, thus it has been applied to treat hemorrhoids after childbirth, and reduce menstrual bleeding, as well as stimulate womb and blood circulation in it. The herb is potent of causing monthlies. According to the results of animal testing, the plant is also able to treat tumors. However, due to its poisonous content, the herb is not recommended to take orally. Additional Info: American mistletoe is occasionally named false mistletoe, to define its separate origin from the mistletoe found in Europe, which belongs to Viscum album genus. Medical capacity of these herbs differs greatly. The plant is evergreen, and grows in form of a bush. 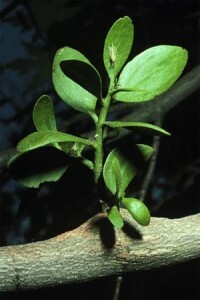 The stem is rough, with nodes, and has green-yellow leaves on it. The leaves are covered with fuzz at the first year of the plant’s existence, and then become smooth. The plant blossoms at the end of spring to mid-summer, and the white-colored fruits can be witnessed in winter. Preparation and Intake: It’s highly necessary to have a consultation with a health-care provider before taking the extract. Safety: In FDA records the herb is marked as dangerous. Internal use is not suggested, and if you’re nevertheless determined to take the herb, consult your physician.